Traditions are extremely important in Chinese culture. Nowhere is this more apparent than in the vast body of tradition associated with the Chinese New Year, or Spring Festival, which marks the beginning of the year according to the ancient Chinese calendar. In the days leading up to the Chinese New Year, Chinese houses are swept and scrubbed, and garbage thrown out, so as to get any bad luck or evil spirits out of the house before the next year starts. This must be done before the New Year because it can’t be done on the New Year itself – for fear of washing away the good luck. Like the Western New Year, the biggest festivities in the Chinese New Year are held before it actually starts. The traditional family reunion dinner is considered the most important meal of the year, and many Chinese people travel huge distances to attend it. The meal is invariably large and ornate. Popular dishes are fish (the Chinese words for “fish” and “prosperity” sound similar), noodles (which can’t be cut while eating, lest the eater’s life be shortened), and dumplings, which are eaten at midnight. It is encouraged to stay awake as long as you can – the whole night, if possible. According to one account, the new year once took the form of a dragon named Nian that terrorized the populace, despoiled crops, and ate people, particularly children. Nian, however, was scared by bright lights and loud noises, and thus firecrackers are set off en masse at 12 midnight. Fireworks often join the spectacle, and with the tremendous racket, it’s no wonder people choose to stay awake. In the morning, fireworks are set off again to welcome in the new year. The color red is to the Chinese New Year what the Christmas tree is to Christmas. It is a lucky color and evil spirits are afraid of it. Lanterns, banners, and clothing each feature plenty of red, and red scrolls with auspicious words written on them are hung on the walls. During the Chinese New Year, people commonly exchange red envelopes called hong bao, which contain money. Elders give them to children, bosses give them to their employees, and friends exchange them with each other. The amount of money given is subject to many superstitions and rules. Dance routines featuring the lion (familiar to Westerners as the long costume with two people inside), and the dragon (a long paper creature held aloft on poles) are common street entertainment. Each troupe of performers tries to outdo the others with elaborate choreography and creative presentation. 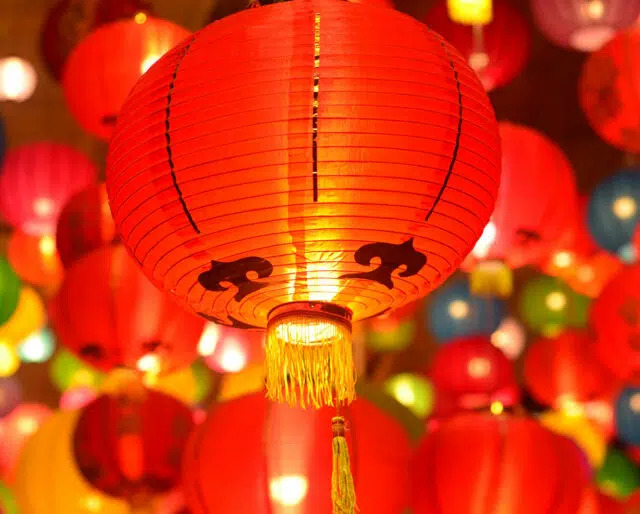 On the fifteenth and final day of the Chinese New Year, people take to the streets to fly lanterns of breathtakingly beautiful colors and designs. Riddles are often written on the outside of lanterns for children to solve. The Lantern Festival is the Chinese equivalent to Valentine’s Day, with unattached young people roaming the streets hoping to find a partner.